Artem Charta's rebound editions allow collectors and fans to own truly unique copies of their favorite books for a fraction of the price of other leather-bound prints. Our process begins by removing the cover and binding, leaving nothing left but the printed pages. From that point on, the book is completely rebound, a process also known as re-casing. All of the original spine is remove and replaced with a new sewn binding. This cleat sewn binding tremendously increases the durability of each book, and helps to ensure that this work of art will last and last. The binding of our books is a very labor intensive process, and is largely done by hand due to the intricate detail in nearly every area of the design. 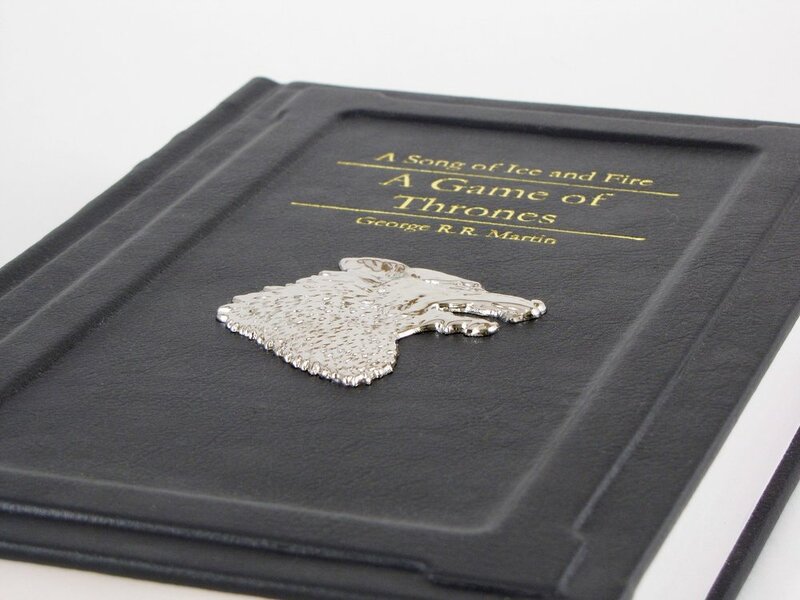 Our First Project: "A Game of Thrones"
A cast metal crest is set into the middle of the front cover, immediately setting our books apart from any you have ever seen. This original piece of artwork is inspired by elements of the story, and gives the cover a whole new dimension of detail. The title is stamped deep into the cover in beautiful gold metallic text. The gold foil stamping can also be found on the spine of each book identifying its number in the series. Unmistakable. Even on the shelf. 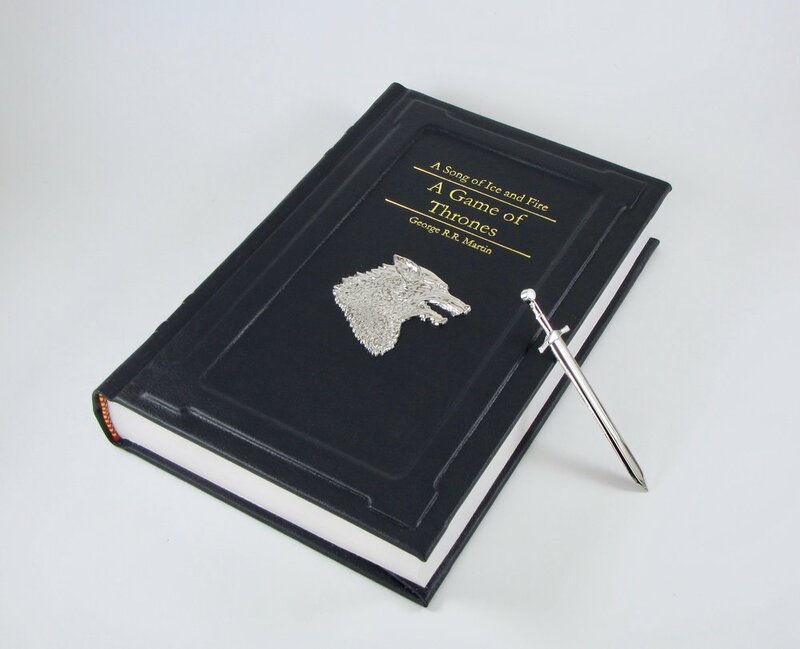 The beautifully numbered and hubbed spine features a decorative sword inspired by the the world of A Song of Ice and Fire. The sword is securely held in place by a strong rare earth magnet concealed inside the spine. This also centers the bookmark on the spine; in the same place each time you put it away. Our exclusive creations are unlike anything you have ever seen. And we want it that way. These unique features require extraordinary craftsmanship and attention to detail. The books are proudly rebound here in the United States. This proximity gives us great control over the quality of our books at every stage, and helps to make sure that we stay on top of the entire process.